When Mark returned home to Tikorangi in 1980 bringing me and our first baby bump, the name Jury was synonymous with camellias. These days Jury = magnolias, but not back then. There is a whole chapter in the family history that is headed ‘Camellias’ but it is largely in the past now. Changing fashion, changing focus and the dreaded camellia petal blight has seen to that. But every autumn, as the sasanquas come into flower we both derive huge delight, particularly from the Camellia Crimson King by the old mill wheel, which is just out from our back door beside the driveway. It is a picture of grace and charm. Sasanquas are the unsung heroes of the camellia family, seen mostly as hedging plants, so utility rather than glorious. But if they are allowed to mature as specimens and gently shaped down the years, they stand on their own merits. Mark declared yesterday that it is the autumn flowering camellias that interest him now, not the late winter and spring varieties. For these autumn ones do not get petal blight whereas the later varieties are now a mere shadow of their former selves, faced by the extreme ravages wrought upon their blooms by blight. Our camellia trip to China in 2016 had us concluding that our mild, humid climate with high rainfall means that we suffer worse from petal blight in Taranaki than pretty much anywhere else, really. It is nowhere near as bad in dry climates. The history of camellias from the middle of last century onwards has some parallels to the history of tulips – all about show and showy blooms. So it was predicated on the quest for the new – extending the boundaries of flower form, size and colour, prizing breakthroughs even when the results were more novelty than meritorious. Camellia societies had enormous flower shows where the staging of individual show blooms was the focus. It didn’t have much, if anything, to do with garden performance let alone longevity as garden plants. Sasanquas didn’t fit this show bench mould. They flowered too early in the season, individual blooms are often quite small, lacking rigid, defined form and falling apart when picked. But fashions and conditions change and these days it is the softer look of the Japanese camellia family member, the sasanquas, that makes us stop and take notice more than the later flowering japonicas and hybrids on which the earlier family reputation was forged. The light airiness and grace of the sasanquas fits our style of gardening far better than the solid, chunkiness of many of the later varieties and the autumn flowers serve as another marker of the change of season. I did a walk around to see how many different blooms I could pick but it is still a little early in the season and some have yet to open. Some plants we leave entirely to their own devices, some we will clean up the canopy from time to time -to take out dead wood and create an umbrella effect, two we clip tightly once a year to a cloud pruned form. With their small leaves, the sasanquas clip well. It just pays to do it soon after they have made their new growth after flowering. Leave it until late spring and you will be clipping off all the flower buds set for next autumn. It takes a few decades of growth to get sufficient size to shape as we shape ‘Elfin Rose’ and ‘Mine No Yuki’ but these specimens now function as distinctive shapes within the garden all year round, rather than melding into the background as most camellias do when not in bloom. This entry was posted in Abbie's column, Tikorangi notes and tagged autumn flowering camellias, autumn flowers, Camellia sasanqua Crimson King, Japanese camellias, Mark and Abbie Jury, sasanqua camellias, Tikorangi: The Jury garden on 21 April 2018 by Abbie Jury. Gardening is wonderfully cyclic on an annual basis. I know I have written about sasanqua camellias before but each year they flower prettily yet again. 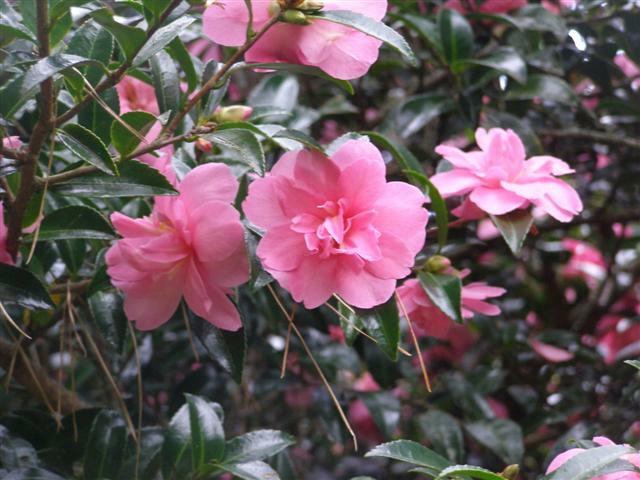 These are the Japanese camellias that light up the late autumn and early winter. There is a softness to the blooms which is in contrast to the stiffer japonicas that flower later in winter and early spring. If you live in Auckland, it is the law to plant only Setsugekka, a big growing white sasanqua. I jest but that is the one you will see there at a ratio of about 20:1. In fact sasanquas come in all shades of pinks, bicolours and even reds as well as the fraightfully restrained whites. Going clockwise from left in the photo are: Elfin Rose, Gay Border, Bettie Patricia, Silver Dollar, Bert Jones and Crimson King. Some may no longer be available on the market but there is usually one that will look very similar. Sasanquas can be slow to establish but left to their own devices, will make light, airy, large shrubs over time. They also clip very well so are ideal for hedging and topiary. When clipped regularly, the growth is much denser. The foliage is smaller and often darker green than many other types of camellias. Some describe them as fragrant. They have a distinctive mossy, slightly earthy sort of scent – it is one of the defining characteristics of a sasanqua. This entry was posted in Plant collector and tagged Abbie Jury, autumn flowering camellias, sasanqua camellias, Tikorangi: The Jury garden on 30 May 2014 by Abbie Jury. Crimson King heralds the arrival of autumn. 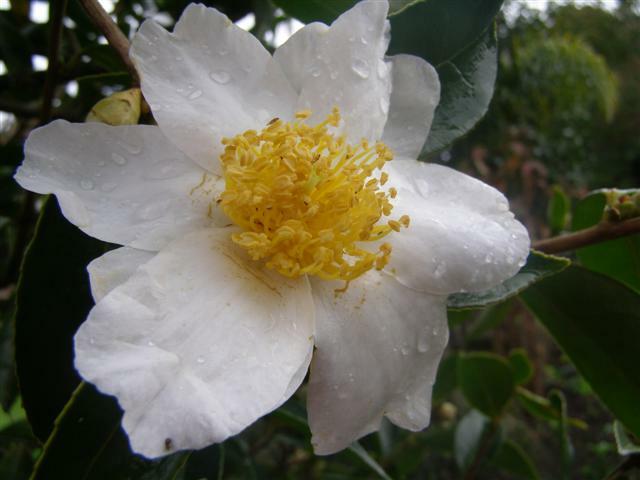 It is a sasanqua, one of the autumn flowering camellia family from Japan. Too many people seem to think that sasanqua is synonymous with Setsugekka (how clichéd is the Setsugekka screen planting?) and only comes in white. In fact there are a relatively large number of family members, including Crimson King. It has the usual sasanqua attributes of finer foliage and a graceful, open habit of growth as it matures. In addition to that, the exceptionally long flowering season means it will last well in winter. Single flowers have just one row of petals and exposed yellow stamens in the centre. The birds and the bees, and indeed the butterflies, need these stamens exposed to be able to feed from the flower. Big full forms or sterile formal flowers are not a source of pollen and nectar. Most sasanquas lack the highly refined flower forms so prized in japonica camellias but single flowers like this shatter and dissipate without ever leaving a sludgy mess below. There is also a simple charm in such a simple flower. Sasanquas are renowned for being one of the most sun and wind tolerant types of camellias. They also flower early enough in the season to avoid the dreaded camellia petal blight. Overseas reports say that they can suffer from this dreaded fungal ailment but we have never seen it in our sasanquas here. Crimson King has a pleasant scent if you stick your nose right in the flower but I think that the faint waft of fragrance in camellias is rather over-hyped. First published in the Waikato Times and reproduced here with their permission. 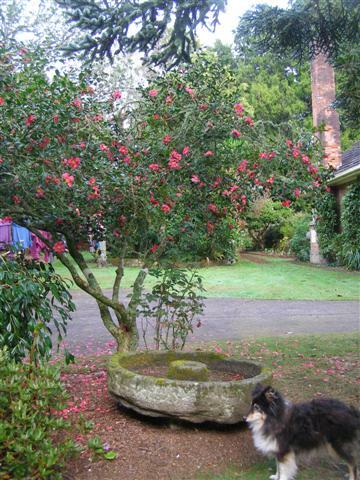 This entry was posted in Plant collector and tagged Abbie Jury, autumn flowering camellias, Camelia sasanqua Crimson King, sasanqua camellias, Taranaki gardens, The plant collector, Tikorangi: The Jury garden on 20 April 2012 by Abbie Jury. Now that we are well and truly into autumn, it is the sasanquas which are the dominant flowering shrub in the garden. What they sometimes lack in flower substance and form, they more than make up in mass display. And in a country where camellias are used extensively as garden plants and shelter, we have been hit hard by the advent of the dreaded camellia petal blight from mid season onwards. The sasanquas flower early enough to miss the onset of that scourge. My personal picks are Elfin Rose and Crimson King which just keep on flowering but there are a host of others which are very charming in their own right – Bettie Patricia, Gay Border, Mine No Yuki, Yoimachi (a sasanqua hybrid), Bonanza and Silver Dollar to name but a few. Many of our plants are decades old, three to four metres high and just as wide. Of all the different groups of camellias, sasanquas particularly lend themselves to clipping and shaping, turning into either layered forms or light canopies often growing from multiple trunks. There is a grace to be found in their natural growth habit and form which is not always present in the more sturdy japonicas. In the species, we couldn’t help but notice that brevistyla was brief indeed in flower. While individual blooms continue to open, the mass flowering can only have lasted ten days. The closely related microphylla, however, has continued to put on a really good show for nigh on a month now. I was writing a piece on the earliest flowering camellias for a national gardening magazine and friend and president of the NZ Camellia Society, Tony Barnes, mentioned C.granthamiana as one of the earliest to open. We have it somewhere in the garden but we appear to have mislaid it – which is to say that Mark can’t remember where he planted it and neither of us have come across it yet. We have what we think is C.gauchowensis in flower. It is another pristine white single bloom as many of the species are , on a narrow, columnar bush. Unfortunately it does get easily weather-marked. Few of the species are inherently spectacular when compared to the modern cultivars on offer but they have a quiet charm which we enjoy. This entry was posted in Camellia diary and tagged Abbie Jury, autumn flowering camellias, Camellia gauchoweneis, Elfin Rose, sasanqua camellias on 13 May 2010 by Abbie Jury.